Welcome to Make It Monday with Kraft Outlet. Use this week's "Fun Shapes", theme to inspire you to create your project and then link it up at the bottom of this post before 6:00 p.m. (Eastern Time) on Sunday March 4, 2012. All of our followers who participant in our challenges for the month of March have a chance to be featured on our "Feature Me Fridays" posts as well as be entered to win a $15.00 Kraft Outlet Store Voucher! The more challenges you enter this month, the more chances you have to win! 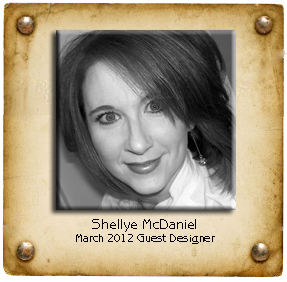 My name is Shellye McDaniel from NE Texas. I've been married for 20 years and recently celebrated my 40th birthday! I have three really great kids: Tyler (17), Zachry (13) and Sydnee (9). I work part-time as a Labor & Delivery nurse. 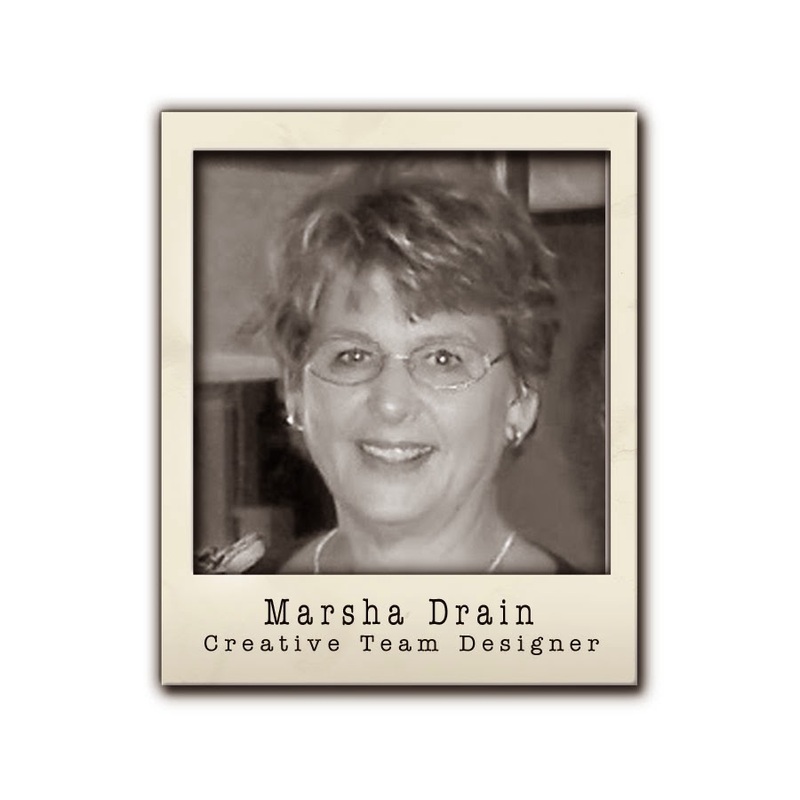 I've been pretty 'crafty' most of my life and started scrapbooking about 14 years ago. 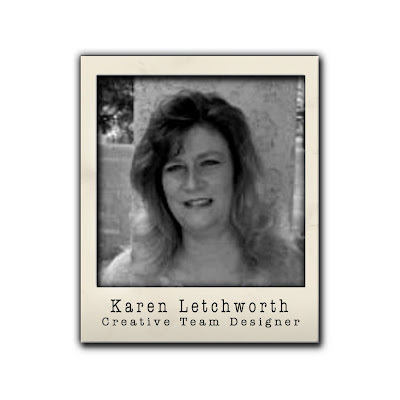 I enjoy creating custom projects for my Etsy shop, as well as cards and scrapbook pages for my family. My other hobbies include: knitting, baking, reading and perusing crafty blogs. I am currently on the Your Scrapbook Stash Design Team and the Paper Issues and I Heart Ippity (Unity Stamps) Creative Teams! My blog is The Papered Cottage. Jennifer created this card on a base of buff ivory cardstock and used an owl die cut and a banner for the "fun shapes" theme of this week's challenge. Elements used to create the banner were some chipboard shapes, hemp cord, and some mini clothespins. Head over to her blog for a complete supply list. 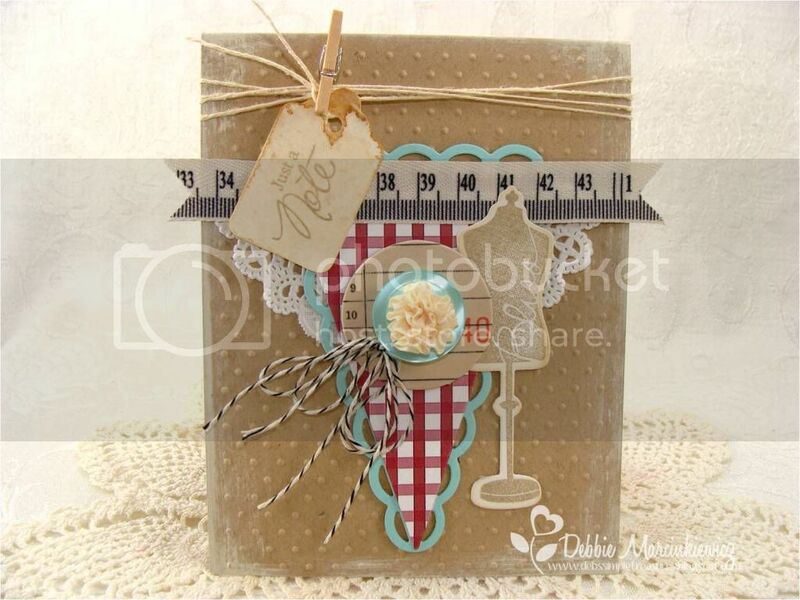 Debbie Carriere made a little shaped card for this week's Fun Shapes challenge. 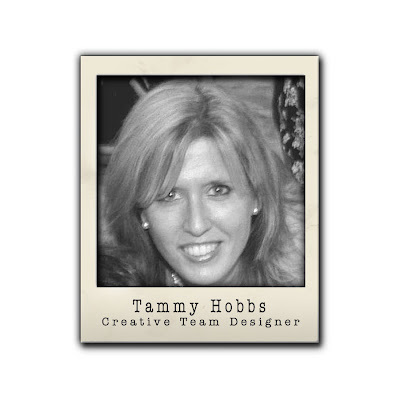 To create her card base, she die cut a frame shape and adhered that to a card base of Brown Kraft Cover Weight cardstock cut slightly smaller than the frame dimensions. She created her image panel by stitching a piece of patterned paper and a piece of Vintage Dictionary page to a Brown Kraft panel. 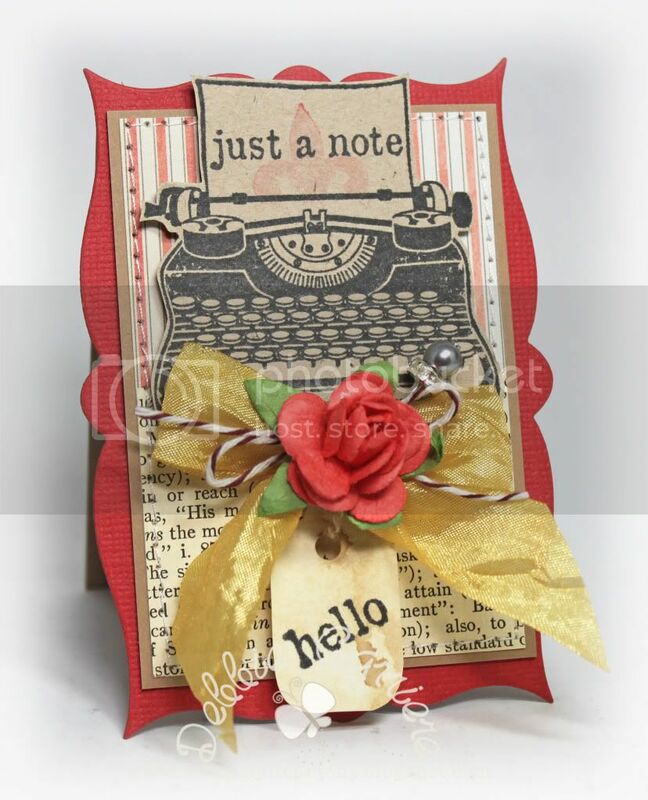 Debbie stamped the typewriter image on Light Kraft Cover Weight cardstock, cut out, and adhered to the panel. She trimmed the smallest tag from the Designers Special Prim Tag Assortment to fit the sentiment and tied it around a seam binding bow. Debbie finished the bow off with a Brown Kraft Baker's Twine bow, Pewter stick pin, and a paper rose. Be sure to stop by her blog for more information. For today's 'Fun Shapes' challenge, Debbie first started with a card base made from Kraft Lunch Bag Cardstock which she embossed with polka dots and inked the edges with paint. Next, Debbie cut a couple of die cut 'fun shapes' ... a scalloped pennant, a regular pennant and a dress form shape. The shaped cut outs were adhered to the cardstock base on top of a paper doilie and a strip of Ruler Twill Ribbon was adhered on top of the shapes. 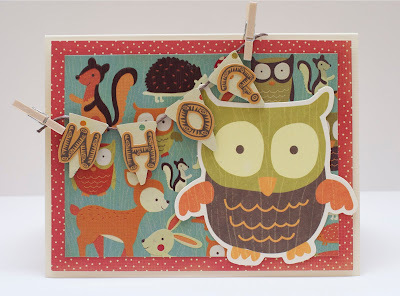 To finish off the 'Fun Shapes' card, Deb added some yummy embellishments from The Kraft Outlet Shop ... a Chipboard Office Button, Black Baker's Twine, Natural Hemp Cording and a stamped X-Small Grungy Prim Tag held onto the cording with a Tiny Wooden Clothespin. Please visit Simple Treasures for more pictures of this card! Looks like the wonderful DT creations have great shapes going on. WoW, such gorgeous eye-candy from the DT! 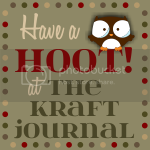 Thank you very much for a fun and 'krafty!' challenge! !